This week, I want to give you a little pick-me-up. A change of pace. A new discovery. It’s time for a “Choose Your Own Adventure” style step in the next direction of your yoga practice and studies. We all get a little lost, or a stuck in a rut. Sometimes we let life get the best of us and we leave our practice behind. Or, we want to jump into the next phase of our spiritual evolution, but we have no idea what that is. I get it, and I’ve been there. Keeping up with a daily practice can be a real challenge, especially when the going gets rough. However, that’s when we need it the most. Learning new things in our spiritual studies is always exciting and intriguing, but discovering the next new thing is a daunting task. These are the kinds of problems I sought to solve with the development of my online programs–my online teacher training and my higher education courses for yoga. I can’t take the time off of work. I don’t want to leave my kids/spouse/family for that length of time. Putting all my training and higher education courses online neutralizes all of these objections. With online learning, you get forever-access to programs and content at an affordable rate without taking time away from life, so you can learn and practice your yoga from the comfort of … anywhere. Let me take you inside my popular book, Myths of the Asanas, in this webinar that teaches you about the three main myths of yoga, and gives you tools to integrate into your practice right away! I’ll share with you how to learn more about the power of myth in your yoga practice! If you love the chakras, this course is the perfect way to dive in a little deeper, tune up your subtle body, and see how online learning really works. This course is a mini version of my full Chakra Therapeutics certification program. Astrology is definitely my favorite complimentary spiritual practice to yoga. 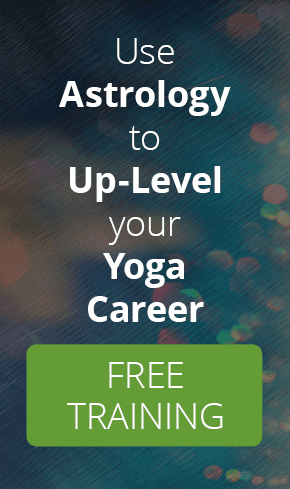 This webinar takes you inside my astrology certification program and gives you some valuable tips you can integrate right away. Don’t miss this chance to see what’s in your stars! Excerpted from my latest book, Yoga Beyond the Mat, this guide explores the root chakra in-depth, and takes you through an alchemical ritual that helps you stand strong and tall! This week, in my Facebook Live broadcast, I talked about what it takes to be a #ModernMystic, and why thinking outside the box is SO important for spiritual leaders today. If you’re ready to hear how you can step into the role of spiritual leadership, and what you might need to consider to do that, watch the replay below! I really hope you take advantage of #allthethings. Give each of these opportunities a shot, and see where they lead you. You may be surprised by what speaks to you and sparks your interest. The whole point here is to step out of your comfort zone, and back into your spiritual practice and evolution. You can find guided practices in my book Yoga Beyond the Mat and my course Yoga Beyond the Mat: Making Yoga Your Daily Spiritual Practice.